Kate completed her practice-led PhD entitled ‘Collaboration in Performance Practice: trust, longevity and challenging proximity’ at Northumbria University in 2010. Much of Kate’s PhD research was carried out through her role as performer and co-artistic director of mouth to mouth | international performance collective; a globally dispersed group of performing artists who utilise Skype technology as a tool for performance. Kate also has a solo performance practice and has performed her one woman show Hand me down extensively, and is currently working on a new solo performance work based on the life of Gertrude Bell with the working title: The GB Project. 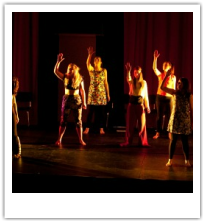 Between 2004 and 2005 Kate worked as a performer with the Northern Stage Ensemble as part of the InterAct Scheme. Kate also worked as Movement Coach on the award winning production Motherland by writer/director Steve Gilroy. Research InterestsKate’s research is largely based in practice led modes of enquiry in the field of contemporary performance practice. Kate is interested specifically in notions of collaboration and ensemble practice, and the potential for international theatre festivals as contexts for collaboration. In recent years, Kate has created new performance works and workshops for theatre festivals in Romania, Croatia, Spain, Ireland and the UK. Kate’s teaching interests span practical and theoretical approaches to performance, often integrating aspects of research into her teaching practice. Kate teaches a number of modules across the undergraduate degree programmes: Performance, Drama and Drama and Script including Movement, Contemporary Performance, Platform Performance, Platform Critique, Devising, Analysing Practice and Facilitation. Kate is currently supervising one post-graduate MRes Arts student. Affiliations and MembershipsKate is on the editorial team of Training Grounds, a section in the Routledge journal Theatre, Dance and Performance Training and is currently working towards a special issue on ‘Theatre and Sport’, to coincide with the 2012 London Olympic Games. Hand me down: A one woman show co-created with Steve Gilroy and produced by The Empty Space. Performed at The Pleasance, Edinburgh Festival Fringe (2008) receiving 4 star reviews (The Scotsman, Metro) and a Fringe First Nomination; Live Theatre, Newcastle upon Tyne (2009); Sibiu Theatre Festival, Romania (2009); Tristan Bates Theatre, London (2011). The GB Project: Currently at work in progress stage. First work in progress showing: First in Three, Northern Stage, Newcastle upon Tyne (2011).